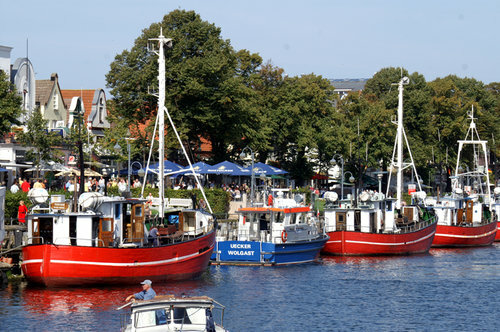 The beautifully preserved old town of Wismar was awarded UNESCO World Heritage in 2001. On your guided tour you will see the market square, typical merchants houses, the town hall, the medieval water system and the pretty Fuerstenhof festive building. In the Gothic quarter the churches of St. Marien and St. Georgen are (partly) preserved and part of a fascinating exhibition about the construction of the medieval cathedrals. Continue to Schwerin, the capital of the state of Mecklenburg Western Pomerania. Schwerin is also the oldest town in the region, dating back to 1160. The main attraction is of course its fairy-tale palace at the lake with is splendid rooms and wonderful gardens. Serving as the seat of the Mecklenburg parliament today, the palace has many a tale to tell. There even is a ghost called “Petermaennchen”. The old town of Schwerin is well worth a visit as well with the State Museum, State Theatre, government buildings from the 19th century and the century old cathedral at the market square. A town with significance where water is always nearby from the 7 lakes that touch the municipality.